Russell Berrie founded the Russ Berrie and Company, Inc. (RUSS), a New Jersey-based company, in 1963. 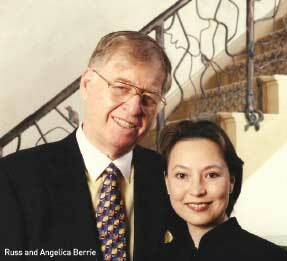 Until his death in 2002, Mr. Berrie served as Chairman and Chief-Executive Officer. RUSS and its wholly-owned subsidiaries design, develop, and distribute gift, home decor, infant and juvenile products through retail outlets worldwide. Mr. Berrie devoted endless time, energy and resources to numerous charitable causes through The Russell Berrie Foundation, created in 1985. As a philanthropist, he supported hundreds of organizations and fostered initiatives that expressed his values, passions and vision in the areas of diabetes, humanism in medicine, Jewish continuity, salesmanship as a profession, arts and culture, honoring New Jersey’s unsung heroes and strengthening communities in northern New Jersey. Since 1997, 356 honorees have received the Russ Berrie Making a Difference Award. Read more about these local heroes and their stories inside!